Will Palestinian Youth Bring the Arab Spring? As popular calls for democracy continue to reverberate through the Middle East, transnational youth organizers attempt to bring the movement to the country with the most complex and intransigent politics in the region. I was recently in the West Bank and Israel and the feeling I had upon leaving was not optimistic. The problems of the Palestinians are manifold. Many lack the rights of citizenship in the Israeli nation which controls their territory, making most forms of vote-linked lobbying and activism invalid. The Israeli Defense Force has isolated them through a complex system of walls, border crossings, highway check-points, and fences. Many of the Palestinians I spoke to in the West Bank did not even travel within the West Bank because they found the IDF check-points so jarring. In addition, Palestinians lack leaders that are able to effectively advocate for their interests. While I was there, Mahmoud Abbas, the President of the Palestinian Authority, even threatened to quit and dissolve the PA. In addition, internecine fighting between Hamas in Gaza and Fatah in the West Bank has played into Israeli hands, facilitating a divide-and-conquer strategy. According to youth leaders, reconciliation is only the first of many demands. The movement which transcends borders… has its eyes set on rehabilitating the scattered Palestinian national body by holding Palestinian National Council elections that include all Palestinians, regardless of geographic location and circumstance. Its ultimate goal: to reconstruct a Palestinian national programme based upon a comprehensive resistance platform. The movement’s horizon may render existing political parties meaningless as invigorated youth activists search for creative ways to shatter the stagnation of their domestic condition…. Well before the call for the March 15th day of action, Palestinian youth, inspired by revolutionary protests in North Africa, had begun to organise themselves in the global diaspora. Where in the past, Palestinian students would belong to Palestinian political factions and organise within the structures of the General Union of Palestinian Students, these structures are nothing but empty shells today. That is why when we did hold the sit-in at the Palestinian embassy in the UK we insisted on using the name GUPS to take back those institutions meant to represent us. As is to be expected, there is tension between the traditional hierarchies of the political parties and the new youth networks. 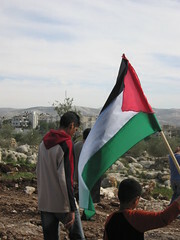 When youth activists suggested that observances of Land Day (recalling an incident in 1976 when Israeli troops shot and killed six people during protests against land confiscations) take place in areas currently the focus of Jewish settlement, the political parties refused to participate. The youth groups organized these alternative observances anyway. Independent youth organizers drew thousands of people to their events, forcing the Palestinian political parties to join them. Wisely, youth are first focusing on reforming Palestinian institutions, over which they are able to exercise the influence of citizens. Influencing Israel, which any successful movement must eventally do, will still be tremendously difficult. Still, these young organizers are operating at the edge of the possible, using the current facility for transnational communication and coordination to build political organizations the world has not yet seem, political organizations based on internal national identity rather than external physical location. In this way the Internet facilitates the political work of diasporas, and of exiles.